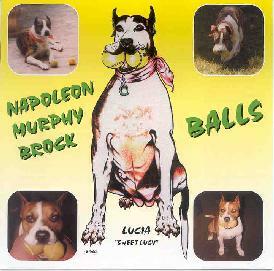 Napoleon Murphy Brock - "Balls"
Well, many of you will know Napoleon Murphy Brock from his work with Frank Zappa. Actually, this is probably the only place you would know him from. He played on several of George Duke’s records as well but has not been very active for many years. This is truly a musical project from his heart and dedicated to all things in his life. I found it to be a very personal work. The music is rooted in 70’s soul and funk. While, I really enjoyed such tracks as "Steady Freddy" and "Patience", others like "Hi Mom-I Love You", were too much like the style of 70s soul music I did not care much for. Don’t get me wrong it is well played and performed. There are quite a lot of different styles represented here. "Tra-Lynn Part 1" is a rap style song with some cool guitar lines and "Patience" is a dark yet beautiful solo piano piece with some nice violin accompaniment. "Let Me Still Be Me" could be a Steely Dan song. The CD ends with "Somebody For Everybody", a slow happy soul song with the type of piano and horns lines that Frank used to use but in not such a serious way. Check it out. For more information you can visit the Napoleon Murphy Brock web site at: http://www.napoleonmbrock.com.